reflected flight, originally uploaded by jahansell. 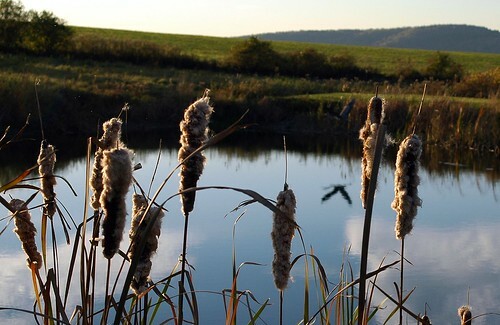 This is the pond at Grandview Farm. As I walked closer, I startled a Great Blue Heron. Can you spot it? cool Jenn! very cool...any luck w/the camera search? can only really see the bird in the water, he blends in with the background too much. Congradulations on witnessing such an amazing creature. Do you have a fancy for birds? A beautiful image. Herons are so stately; I like seeing his/her reflection. So the picture was just a spare of the moment, you don't actively photograph arians? Cut wing, I do have quite a fancy for birds - I've been a bird watcher for 20 years. But I don't actively seek to photograph them - I don't have a long enough lens. Have you been to Brookville Daily Photo? Old Man Lincoln is an amazing bird photographer! When I read that, I took another look and saw the reflection. It would b great to capture it as the subject, with that long lens.